On November 12, 2015 Athens became a sea of protesting demonstrators under the banners of PAME. A 24-hour general strike was held in Greece with the participation of workers from the private and public sector against the anti-worker anti-people measures of the SYRIZA-led government. These are measures that further tear down the state’s social security system, increase the retirement age, etc. The All-workers’ Militant Front (PAME), which is an assembly of class-oriented trade unions, played the leading role in the strike against the SYRIZA-ANEL government, the European Union, the government and employer-dominated trade union forces. PAME organized 71 strike demonstrations all over the country, in which the overwhelming majority of the demonstrators participated, in contrast with the clearly smaller demonstrations organized by the employer and government-led trade unionists of GSEE and ADEDY. The governmental party SYRIZA in a brazen display of hypocrisy called on the workers to participate in the demonstrations of GSEE-ADEDY against the anti-people political line of its own government. At the side of the workers in PAME’s demonstrations there were also the unemployed, pensioners, self-employed organized in The Nationwide Anti-monopoly Rally (PASEVE), the poor farmers, whose associations are organized in the All-Farmers Militant Rally (PASY), as well as the youth (The Students’ Front of Struggle-MAS and also thousands of school students) and women from the popular strata under the banners of the Federation of Greek Women (OGE). 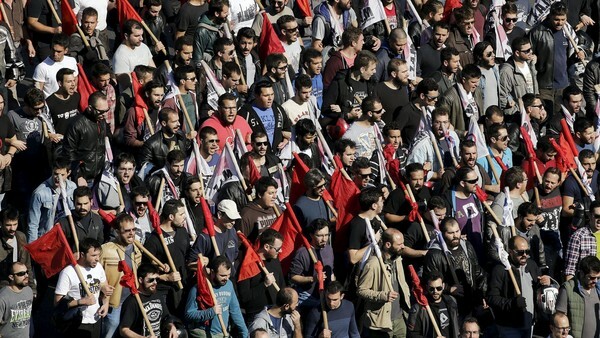 PAME’s forces held a magnificent rally and march in the Greek capital in front of the Greek parliament. “We strike and demonstrate today, because the measures passed by the government and those that it is preparing to bring in November and the next few months will be the “tombstone” for social security, pensions, health and welfare services and will bring new reductions in pensions and salaries. We must make them understand that we will not become the slaves of the 21st century! We are here on path of struggle, determined to escalate the struggle and stop the crimes of the SYRIZA-ANEL coalition government, the European Union and the big businessmen, who are trying to convince us that everything is happening for our own good and that it is necessary and inevitable. What is necessary and inevitable is the path of struggle so that we can get rid of them once and for all. So that we can get rid of the decay and parasites of society, of those who drink our blood everyday, suffocate us with debts, unemployment and problems. State-guaranteed social security for all. No workers’ or people’s housing to be taken by the banks. An end to the heavy taxes on the families of working people. Immediate protection measures for the unemployed. No to starvation wages. Recovery of the losses in earnings now. 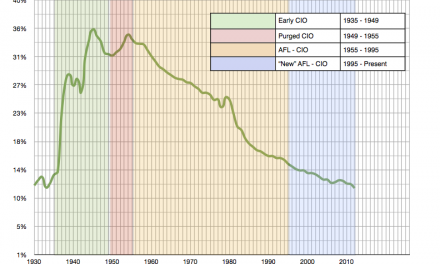 The return of salaries and pensions to the levels of 2009. No worker to be paid less than 751 euros a month. No one without a collective bargaining agreement – no one without social security coverage. No to all the privatizations. The plutocracy must pay for the crisis and the debts which it alone created. 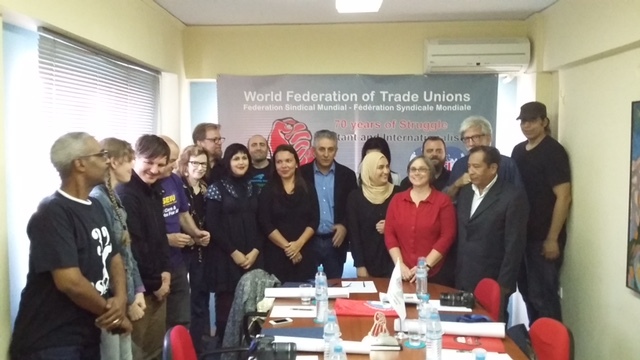 It should be noted that dozens of trade unions from all over the world expressed their solidarity with the strike struggle of the Greek people. Unfortunately, the international mass media once again concealed the truth from the workers, focusing mainly on the sparsely attended rallies of the pro-government trade unionists, as well as on the minor incidents involving the police, created by small groups of provocateurs. It should be noted that from the crack of dawn, trade unions and struggle committees rallied in PAME protected the strike. The members of the class-oriented trade unions outside the ships, the building sites, the factories, services and other workplaces called on the workers to strike and join the strike demonstrations of PAME, with its class-oriented framework of demands. The Executive Secretariat of PAME, in its statement, saluted the mass participation of the workers in the strike and noted that the strike on the 12th of November was only the beginning!